Honda was once a pioneer and leading proponent of hybrid cars – as witness the space-age, two-seater Insight that first arrived 20 years ago. But over the past few years it seemed that the Japanese company had given up on the fuel-saving technology. When I last visited the company in late 2016, to drive the old Insight model on its heritage fleet, the only new hybrid Honda in UK showrooms was another two-seater: the NSX supercar. I’m sure the NSX has many merits but it was not exactly designed as frugal family transport. So it was very pleasing to encounter a new hybrid Honda, which is indeed intended to provide frugal family transport. 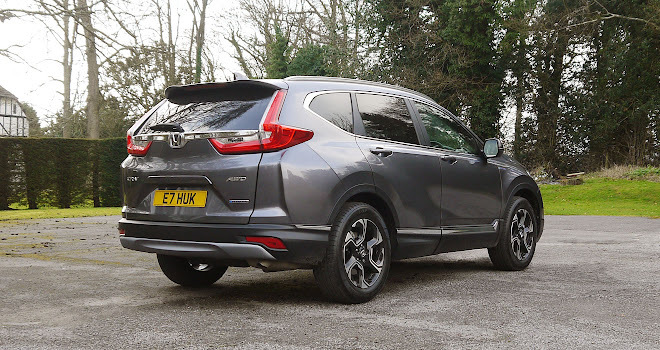 The latest fifth-generation CR-V arrived in the UK in September last year and the hybrid version pictured joined the range in February. Honda expects the hybrid to account for about half of all sales, at least partly due to the lack of a diesel option. With diesel sales tumbling across Europe, we will no doubt see more models switch to a choice among petrol, petrol-electric and pure electric drivetrains in the future. Previous Honda hybrids including the Civic, Insight and CR-Z were never as ambitious in fuel-saving terms as their Toyota equivalents, which perhaps is one reason why they sidled off-stage even as Toyota’s offerings began to form a small crowd, with the Prius, Auris, Yaris, Rav4, C-HR and Camry, plus just about every model of Lexus, offered in hybrid form. 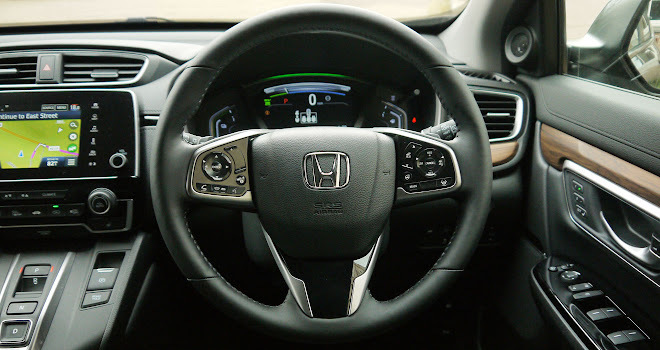 Happily, Honda’s new CR-V Hybrid has not arrived with an update of Honda’s old lukewarm Integrated Motor Assist technology. The new Intelligent Multi Mode Drive (i-MMD) system is a much more ambitious effort, with a clever new hybrid arrangement that prioritises electric propulsion and aims to shut the engine down as often as possible. The new hybrid system seems both clever and simple, with three different operating modes. The simplest uses a battery and motor to drive the wheels, in EV mode. When the 1kWh lithium-ion battery starts to run down (which is often, because it’s only a small battery) the 2.0-litre engine fires up and runs a generator, which supplies fresh electricity to the drive motor and sends any excess electrical power to the battery (topping it up so it can support another brief bout of EV running). 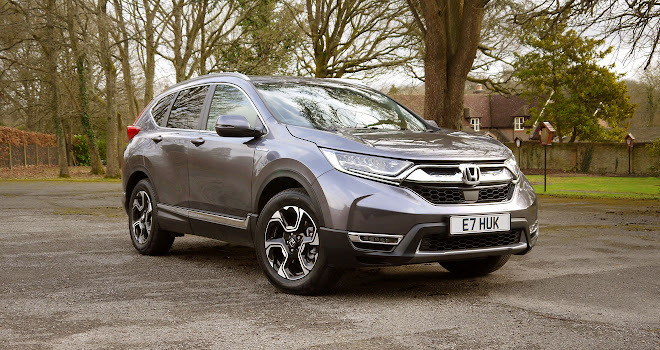 At speeds above 50mph, the engine is coupled directly to the wheels (with a fixed ratio – there’s no belt-drive CVT or other multi-ratio gearbox involved) so that the CR-V runs directly on petrol power. And if there’s power to spare in this engine-driven mode, the engine will also run the generator to top up the battery. Switching between the three modes is unobtrusive – it’s not easy to tell when you’re running on generated electricity versus direct engine drive unless you call up the right graphic in the CR-V’s digital cluster. And even then it’s not remotely obvious, to be honest, given that clear and unfussy instrument graphics are not a Honda strong suit. But the new hybrid system undoubtedly works. I tested both a front-wheel-drive and 4x4 version of the CR-V Hybrid and achieved pretty close to 50mpg in both (with the all-wheel-drive version only marginally worse). That’s not a figure I’d normally expect to hover around in a spacious, mid-sized, petrol-powered SUV. 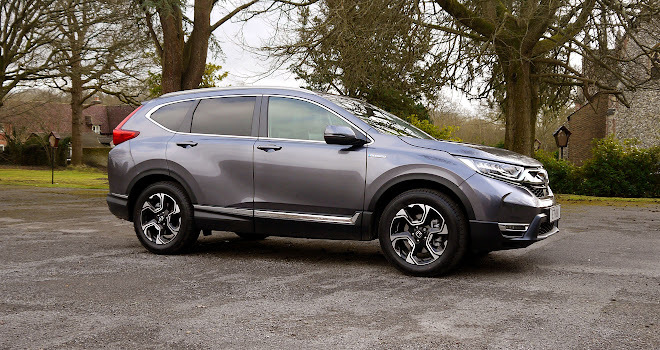 The system is also quiet – or at least well muffled – because the hybrid CR-V provides a very restful way to get from A to B. It’s not fast or remotely sporty, but it is lovely to waft around thinking about how much fuel you’re saving whenever the car switches into its even-quieter EV mode. 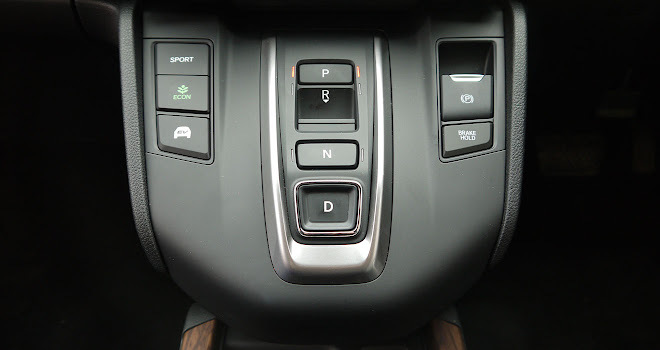 One handy feature is the use of paddles behind the steering wheel to adjust regenerative braking – one going up in steps, the other down. If you like a gentle, gliding approach, leave things alone. But tug a few times on the left paddle and you’ll find the car slowing more quickly as you lift off. 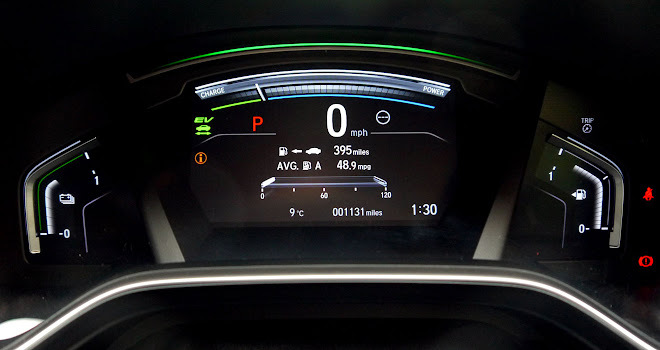 At the strongest setting, the regenerative braking would allow one-pedal driving, but in reality that setup is not an option because you can’t choose the level you’d like and set the car to stay that way. After a few seconds the regeneration level will return to its default setting of gentle braking, no matter what you do with the paddles. Other technologies on offer are broadly impressive. 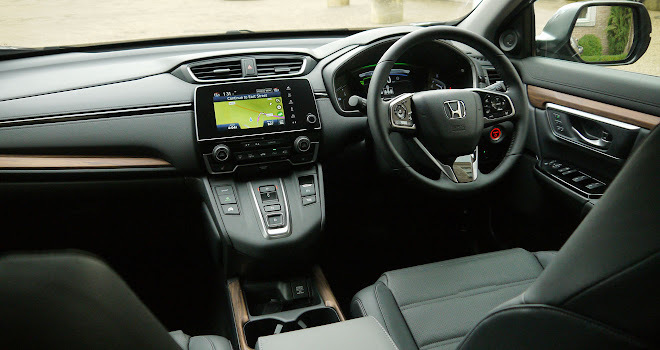 Honda’s variety of active cruise control works well, and its steering assist system provides firm guidance to keep the CR-V centred in its lane, which I think helps me to devote more attention to what other vehicles are up to on motorways. 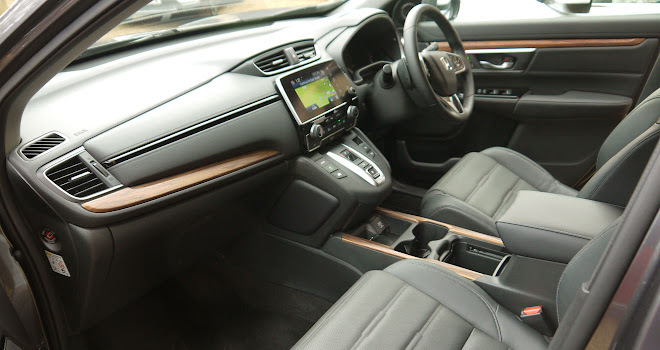 The seats are firm and supportive, offering good comfort throughout my day of testing, and I found it easy to adjust the seat and steering wheel to my liking. The push-button transmission controller is unusual but easy to fathom, and the electronic handbrake with auto-hold worked as expected. Less welcome, to my eyes at least, were the strips of wood-grain trim affixed to the centre console and dashboard, which have clearly been hewn from a plastic tree. 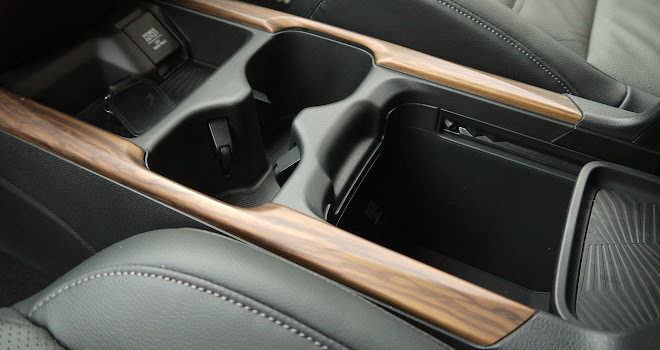 More persuasive is the capacious centre console, which offers a pair of good-sized cupholders and a large, configurable space under the centre armrest with a removable lid that also serves as a divider. 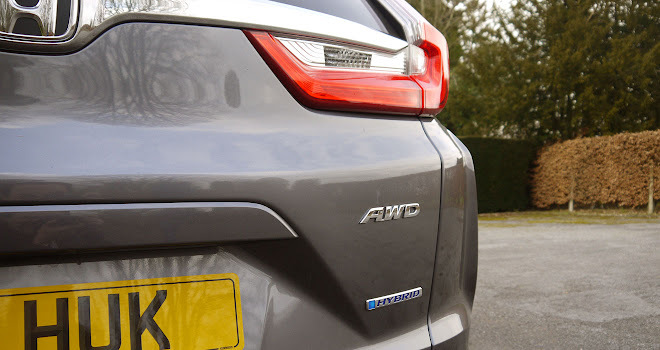 As ever, there are packaging drawbacks in choosing the hybrid version – most notably the loss of the option to pop a space-saver wheel under the boot floor, or the option to choose seven seats, which is available with non-hybrid variants of the CR-V.
At 4.6 metres long, the CR-V falls somewhat between most other SUV offerings, noticeably longer than typical five-seaters like the Nissan Qashqai or VW Tiguan but shorter than most seven-seaters like the X-Trail or Tiguan Allspace. 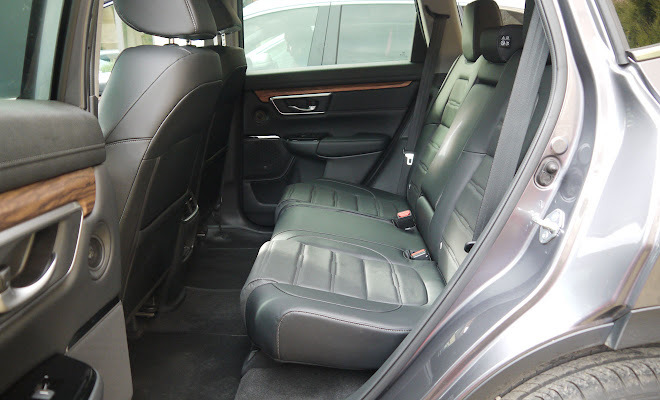 As a result, in five-seat guise, the CR-V provides generous legroom in the rear. I imagine a full seven-seat CR-V must be as comfortable as your first yoga class in the rear row, but that’s not a problem faced by hybrid buyers. Interestingly, the CR-V is almost exactly the same length, width and height as Toyota’s freshly launched Rav4. It is, however, a little bit more expensive. The Rav4 hybrid price list runs from £29,640 to £36,645 on the road, while the CR-V hybrid starts at £30,130 in base S grade and tops out at £38,280 for the top EX trim level. Indeed the posh Lexus NX 300h starts at £35,950 before options, which may give pause for thought among potential CR-V buyers. In CO2 terms too, the Honda won’t blow any minds, with a 120g/km rating for front-wheel-drive variants and 126g/km for all-wheel-drive cars. By contrast the new Rav4 hybrid ranges between 102 and 105g/km. The Rav4 is also half a second or so quicker to 62mph. I’ve not driven the Rav4 yet, so I can’t say how it might compare to the CR-V in terms of comfort, refinement, quality, driving pleasure or any of the other myriad factors that separate an appealing car from a wheeled pig. But on paper, the Honda does seem to trail a bit behind. 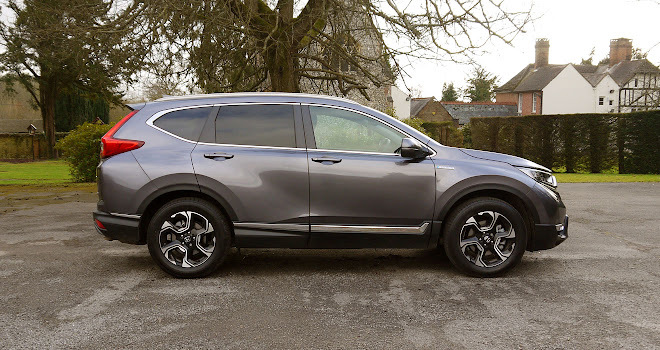 On the plus side, the Honda is arguably better looking than the Rav4, with some nice muscular curves on its flanks and an imposing, get-out-of-my-way face. Only its busy backside lets it down on the styling front. It also seems as well put together as you’d hope of a Honda, with no squeaks or rattles and a tightly assembled cabin and exterior. Overall, the CR-V Hybrid may not have quite raced to the head of the field, but the first new petrol-electric offering from the company in ages is at least a promising sign for the future.